Tortellini Di Pollo Con is a delicious Italian dish made with chicken, healthy vegetables and flavourful spices. 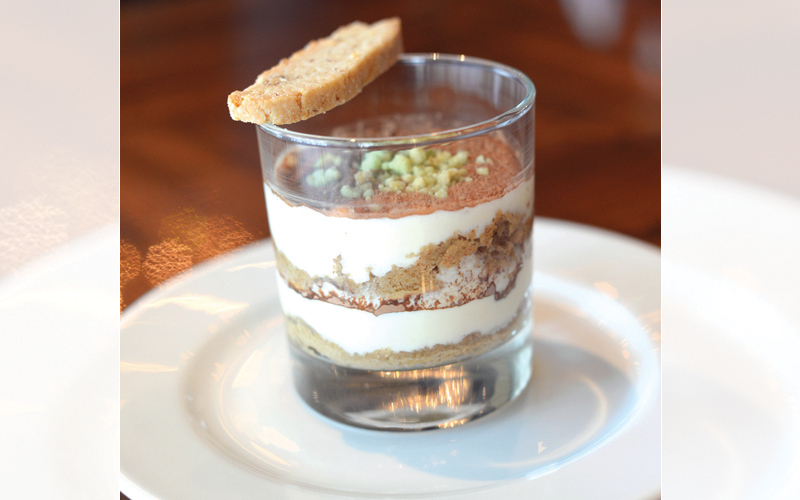 Tiramisu is a coffee based sweet dish prepared with eggs and mascarpone cream. A chef from Park Hyatt has shared these two recipes. Cut and mix the vegetables with the chicken, salt, black pepper, butter, olive oil, and rosemary. Roast the chicken in the oven and once it gets a little bit of colour add the chicken stock. Roast for an hour. Remove the bones and rosemary. Mince all the vegetables and the chicken and add Parmesan cheese and eggs. Add salt, pepper, and nutmeg. Mix fl our and semolina with salt and egg and mix the dough until it becomes smooth. Rest the pasta dough in the fridge for 30 minutes before using. Stand the pasta sheet (1.5 mm size) and stuff it with the chicken mixture. For the porcini mushroom sauce, soak the porcini in hot water. Sauté the onion and garlic in olive oil and butter. Then add the porcini, porcini water, salt, black pepper, and tomato sauce. Cook for 30 minutes and add the basil leaves. Blanch the tortellini in salty boiling water and sauté the tortellini in the porcini sauce. Serve with fresh shaved Parmesan cheese. Serves six. In a double bowl, mix half of the sugar with egg yolk until it becomes foamy. Mix the egg white with the rest of the sugar and whisk it until it becomes like meringue. Once the yolk is cold, mix it with mascarpone cheese and egg white (do not overmix it). Soak the savoiardi in the coffee and arrange it in a square ceramic dish. Then add the mascarpone cream, cocoa powder, and again one layer of soaked savoiardi on it. Serve with cocoa powder on top. Serves six.